Why does the Qur’an praise Mary, the mother of Jesus, as a “woman above all women”? Why does it venerate Jesus as “the Messiah,” and even “the Word of God,” while insisting that he is not divine and that Christians should not believe in the Trinity? 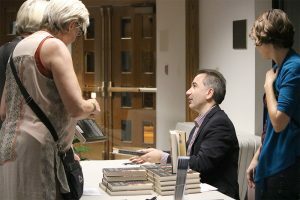 Mustafa Akyol signs books after the lecture. These and many more questions framed a recent discussion with Turkish journalist and author Mustafa Akyol. The event – titled “The Islamic Jesus: A bridge between Islam and Christianity?” – was hosted by Eastern Mennonite University’s Center for Interfaith Engagement (CIE) on Oct. 10. 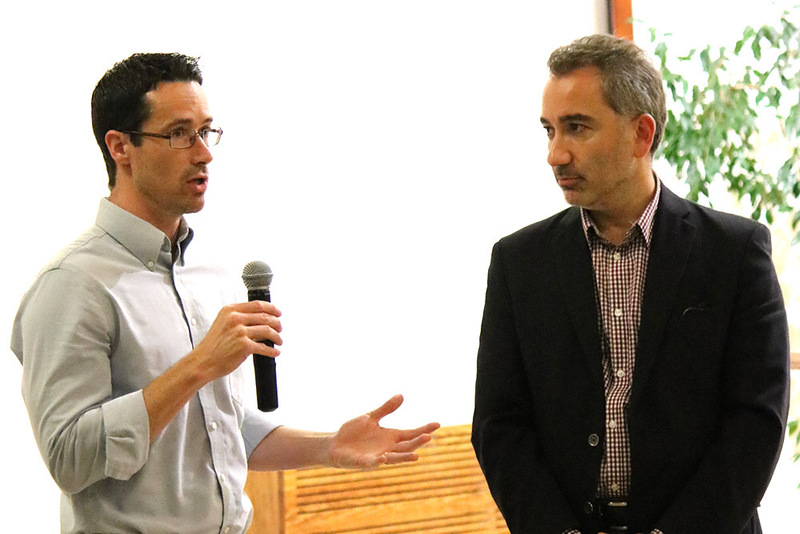 Met by an engaged audience with no shortage of questions, Akyol presented insights about Jesus from a Muslim perspective and about the possibilities of interfaith relations among Judaism, Christianity, and Islam, said CIE Director Timothy Seidel. In his new book The Islamic Jesus: How the King of the Jews Became a Prophet of the Muslims (St. Martins Press, 2017), Akyol explores “theological pathways” between Christianity and Islam. The book has received praise from The New York Times, Publisher’s Weekly, Kirkus Reviews, the National Catholic Reporter, and more. Another of his books, Islam Without Extremes: A Muslim Case for Liberty (W.W. Norton, 2011), was longlisted for the Lionel Gelber Prize, a literary prize awarded by the University of Toronto for the best nonfiction book in English that seeks to deepen public debate on significant international issues, and praised by The Financial Times as “a forthright and elegant Muslim defense of freedom.” It has also been published in Turkish, Malay, and Indonesian. The event was co-sponsored by CIE, Campus Ministries and the Bible and religion department.